ODOURLESS long-lasting liquid insecticide guaranteed by the micro-encapsulation which permits slow release of the active principle, in a bottle with pump (no gas). Against cockroaches, ticks, bugs, fleas, mites, ants, woodworms, flies and mosquitoes. Its formulation and gas-free dispenser means the product is not dispersed in the air but only deposited where it is dispensed, making it ideal for use in homes where there are children and pets. Not for use in places frequented by cats. Notes: Against both flying and crawling insects. As Habitat's active principle is MICROENCAPSULATED it is only issued when the solvent (water) evaporates. It is therefore less harmful during treatments. It is odourless. Respect the environment: A water-based product, it does not contain organic solvents (deemed to be highly pollutant). Shake well before use so that the active principle, which is normally deposited on the bottom, is distributed throughout the bottle (otherwise most of it would be distributed the first time it is used so that all the later treatments would be ineffective). 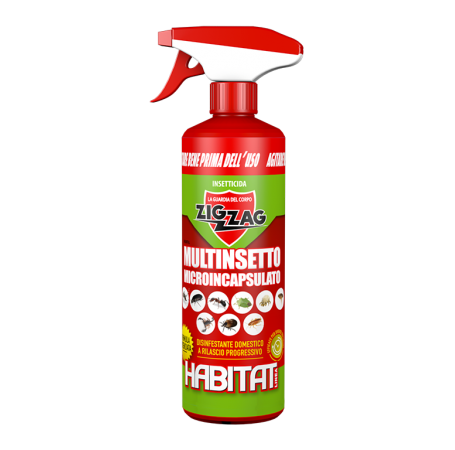 Spray Habitat on the walls, floors, ceilings, cracks, fissures, rugs and doormats and in all the places in which insects can nest. Walls, floors, ceilings, fissures, cracks, rugs, doormats and anywhere insects nest. Foods and containers for food. In places where cats can be found. Habitat's main active principle is MICROENCAPSULATED. The microcapsules attack the feet and antennae of insects which do not die immediately (as this is a "slow release" product, one in which the active principle is released only when the solvent evaporates), and so they have time to return to the nest and contaminate the entire colony. The product mainly acts by contact but also by ingestion.